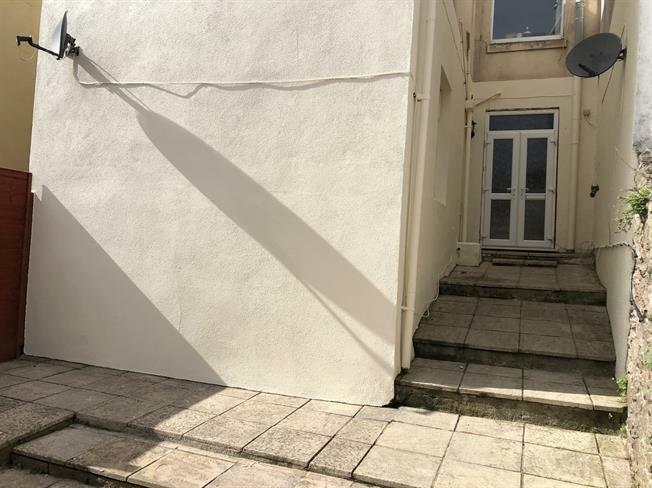 2 Bedroom Flat For Sale in Torquay for Offers in excess of £110,000. Having no onward chain, a two bedroom garden apartment having a living room, kitchen, shower room, double glazing, central heating, patio and a garage. Fitted with a range of matching wall and base units with work surfaces over incorporating a one and a half bowl stainless steel sink unit with mixer tap, gas hob with electric oven under and extractor hood over, space for washing machine and fridge/freezer, tiled flooring, part tiled walls, open to inner hallway with an airing cupboard housing the boiler providing heating and hot water. Fitted with a corner shower cubicle with an electric shower, low level flush WC, pedestal wash hand basin, heated towel radiator, tiled floor. To the rear of the property, there is access to the garage with an up and over door, to the side of the garage there is a path with a couple of steps leading to the paved patio with a stone wall surrounding and access to the apartment.